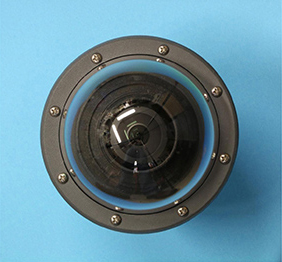 Many all-sky cameras incorporate a video camera for image capturing which may not result in optimal image quality. 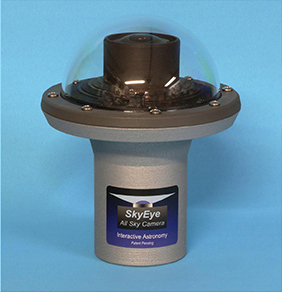 The SkyEye all-sky camera utilizes a true astrophotographic CCD camera to capture images. Exposure times are user adjustable from .6 second to 1000 seconds and dark frame calibration is available for long period exposures. Resulting images can be saved and viewed as still frames or combined and rendered into video format and uploaded to the web with the included software. The SkyEye camera has a moderated field of view to minimize image distortion. The camera comes with a very high quality, f/2.0 2.6mm, lens from Sunex. Rather than try to achieve a full 180 degree field that often encompasses unwanted lights on the horizon, this lens produces a 161 x 112 degree field of view. This provides a field that nearly covers the entire CCD chip from corner to corner. An adjustable lens shade also provides additional masking in the corners of the chip to block any stray lighting, if needed. The SkyEye system includes a full-featured software suite for capturing and analyzing images. SkyEye Capture is a multi-threaded application featuring full camera and exposure control, automatic start/stop, ftp client and on-the-fly anomaly detection as well as automated video rendering in popular video formats. The companion SkyEye Viewer program can be used to review previously captured frames, create custom movies and detect anomalies in recorded frames. SkyEye camera software requires a PC operating Microsoft Windows XP™ or better and 500 megabytes of hard drive space. Windows 7™ and multi-core processor recommended. * Automatic dew heater control requires an optional X-10 controller kit.